Inventory Tweaks allows you to sort your inventory and chests automatically by grouping item stacks of the same type together. When a tool breaks during use, a new tool of the same type will be moved instantly to that hot-bar slot if available. This allows players to mine or dig without interruptions. When a player places the last block in the stack they were holding, a new stack of the same material is moved to that hot-bar slot to allow continuous building. This has been known to move the incorrect items to your hot-bar when placing items that have been added mods. When a player eats or uses an item the same item will be moved to that hot-bar slot. 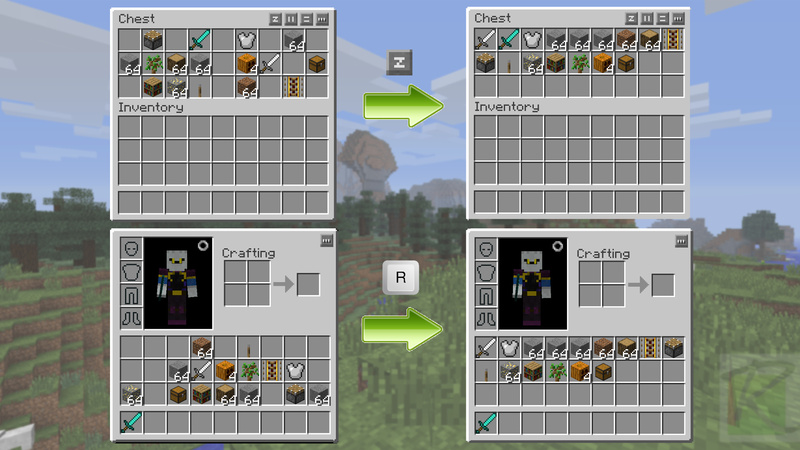 Pressing the "R" key (default) or the Middle mouse button, will sort your inventory according to the sorting rules in the mod settings (accessed by the button in the top-right of most inventory screens) and "sorting rules" text files. You can hold the "Ctrl" key and Left click a stack to will transfer 1 item from the stack giving similar functionality to Shift clicking. If a number from 0-9 is pressed the item that is being hovered over will get transferred over to the number slot in the hot-bar and if no item is being hovered over it will move the item from that number slot on hot-bar to where the mouse is if an item is in the slot you want to transfer it to when the number key is pressed it will switch them over. When the Spacebar is held and then the Left mouse button is clicked it while hovering over an occupied slot it will transfer all the items from that inventory to the other and will not move the hot-bar items.